Available now from the Perth Mint are two coins that are ready to slug it out against each other, like the figures they represent. 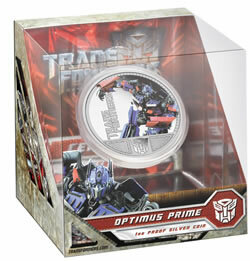 The Transformers Silver Proof Collector Coins, one featuring the heroic Autobots leader Optimus Prime and the other depicting the evil Deceptacon leader Megatron, were minted with the approval of Hasbro and Dreamworks. Sure to capture the interest of coin collectors, movie fans and more importantly the eye’s of the young who may step toward a new hobby in numismatics, each coin is struck in an ounce of silver and in collector proof condition. The Transformers were based on action figures that could convert from everyday mechanical objects into robots. Hasbro initiated the line in 1984, and a cartoon series featuring the robots came soon after. The line has grown over the years to encompass new characters and several series of cartoons. Leap ahead to 2007, when Dreamworks and Paramount collaborated to create a new live-action film incorporating computer generated graphics of the well-known robots. The movie Transformers was a huge blockbuster success, taking in an almost $70 million just in North America in its opening weekend. It would continue to rake in the cash and is estimated to have made over $700 million worldwide, ensuring a sequel would soon follow. Transformers: Revenge of the Fallen debuted June 24, 2009 and once again blew the box office apart. In less than two weeks, it is estimated the movie has made over $590 million worldwide. Each coin is struck from 1 oz. of 99.9% pure silver in proof quality and is issued as legal tender under the authority of the Government of Tuvalu. The characters of Optimus Prime and Megatron are both presented in color on the reverse of their respective coins and also feature that characters affiliated logo and the Perth Mint’s ‘P’ mintmark. A maximum mintage of 5,000 units of each character will be strictly adhered to. The 40.60 mm diameter coins will ship in illustrated presentation packaging and are accompanied by a numbered Certificate of Authenticity. Each is priced at $88.64 (~$70 US). these are going to sell out fast. i just bought 2 of each because i think they will end up like the red back spider. better get in quick. OMG!!!! that is soooo awsome!! GO AUTOBOTS!!!!!! I want to buy some Transformer Coins. Can you help? I finally got mine shipped from Australia. I love them; Thanks!